Dynamic, versatile... what more do you want? Reinhold Bogner was on the frontline of the high-gain amp revolution, and here he’s teamed up with studio desk pioneer Rupert Neve. 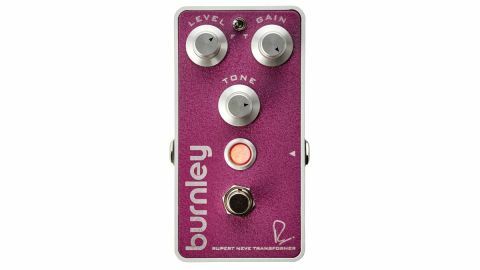 The Burnley is a 100 per cent analogue distortion, equipped with Neve-designed transformers, and the promise of “fire-breathing pandemonium” - a promise slightly at odds with its clean, modern looks. The standard controls are joined by a fat/tight switch and it can be powered from a battery or power supply. Tonally, it’s less molten metal and more aggro rock monster, but it cleans up nicely for overdrive and semi-clean sounds. Meanwhile, flipping to Fat and upping the gain screams for chunky power chord riffs.